Poppy, an eleven week old Labradoodle, presented to us out-of-hours one Saturday night after the Labrador side of her breeding – considering anything as edible! -got the better of her. Much to her delight she had found the coffee grounds from the cafetiere that had been put on the compost and had eaten them all up. Her owners rang, wondering if this could be harmful to her. They were informed that it could be if the amount ingested exceeded the toxic dose. As Poppy was only a little dog the risk of this was increased, so they were advised to bring her in. Coffee contains caffeine which is an alkaloid structurally related to theophylline (found in tea) and theobromine (the main alkaloid in chocolate). The alkaloids can have a positive effect on the heart and central nervous system but in excess they can cause vomiting; diarrhoea; increased body temperature, breathing and heart rate; restlessness; agitation; twitching or convulsions. 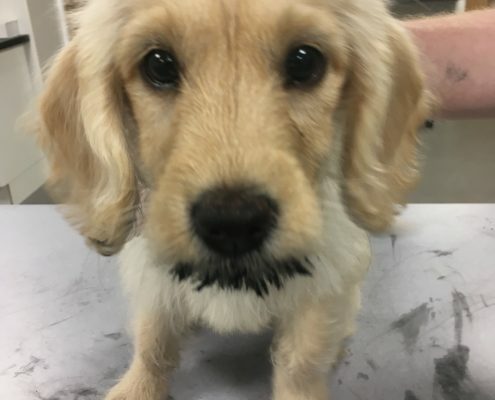 When Poppy arrived at the surgery she was very excitable but being a young puppy it was hard to tell if this was normal or the effect of the caffeine! Her heart rate was high, however, and she had some diarrhoea so we admitted her for an overnight stay. It was not worthwhile giving her an injection to make her vomit as the length of time elapsed since eating the coffee meant that it would no longer be in her stomach. She was put on an intravenous drip to flush out the caffeine and also received activated charcoal three times through the night to try and limit any further absorption of caffeine from the gut. Unlike most dogs Poppy was only too pleased to eat the charcoal which made our job very much easier. The photo show her with a black chin immediately after one of these doses. By the morning Poppy’s heart rate had returned to normal, she’d had no further diarrhoea and was fine to go home.